If you should decide to test the waters this year when it comes to shopping on Thanksgiving weekend, you may be wondering when it’s more worth it to shop. Maybe you want to shop on Thanksgiving evening or you may enjoy Black Friday for the sales and experience. Or, maybe you’re like me and can’t wait for Cyber Monday. I love shopping from the comfort of my own home whenever possible, so Cyber Monday has been one of the best things since sliced bread. 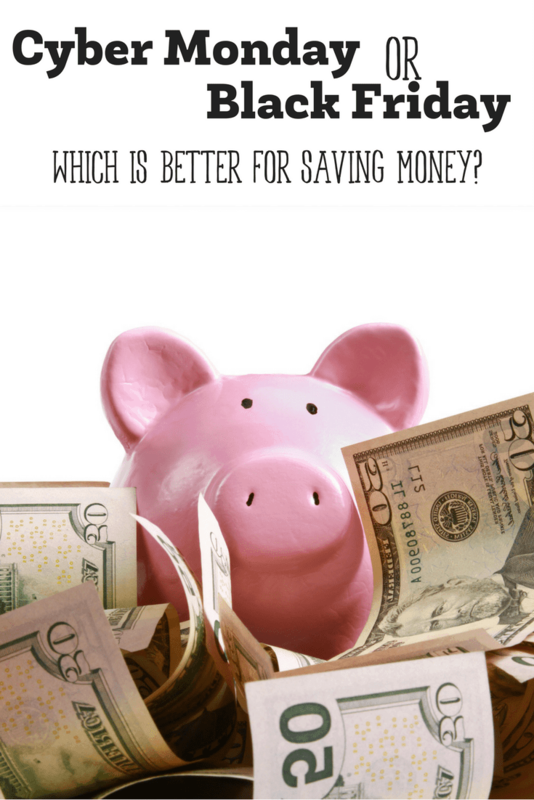 But which is better when it comes to deals and savings? 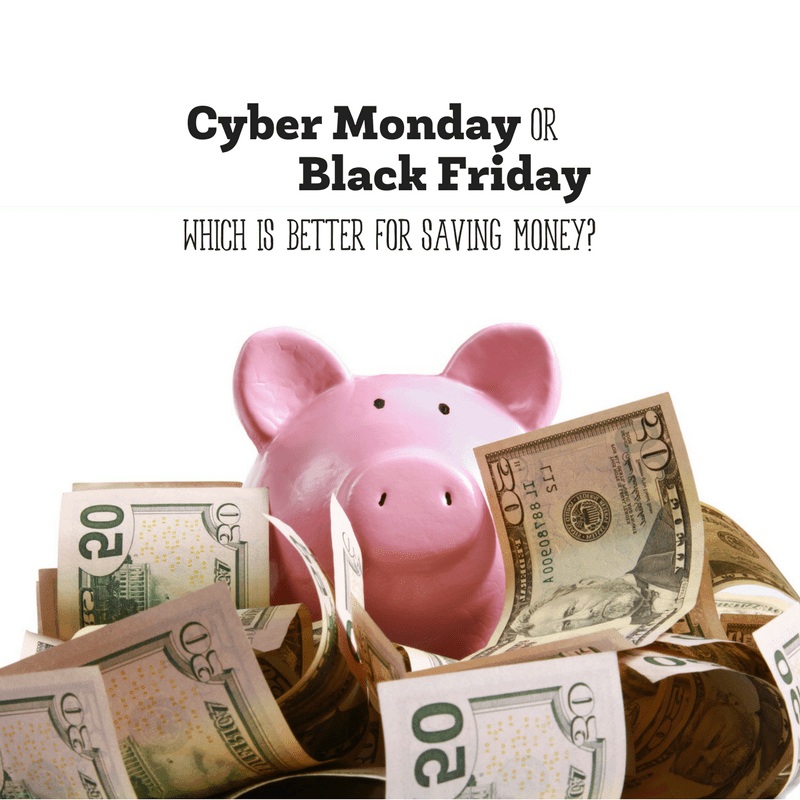 Is Black Friday or Cyber Monday better for shoppers? Let’s take a look. Everyone seems to have an opinion and the opinions vary from one person (or site) to the next depending on the experience they’ve had or where they do their shopping. Some people think that Black Friday ads are more “bait and switch,” where the retailers lure you to their stores to purchase a certain item that happens to be sold out in hopes that you’ll stay and purchase something else. Cyber Monday has risen to new heights in the shopper’s favorite day of the year category. There are some who don’t relish the idea of putting on riot gear to enter the crowds on Black Friday or the day after Christmas. For those people, Cyber Monday is the best day. And, for those in the know, Black Friday’s deals aren’t necessarily the best deals to be had during the holiday season – even though most of us think so. Electronics, especially, are usually much less expensive after Black Friday. But, you may risk not getting exactly what you want if you wait for a better deal because so many will snap up the most popular electronics either before or on Black Friday. The weekend after Thanksgiving is touted as the best time to check off toys from your gift list, but Cyber Monday is actually the best time for the cheapest bargains. Add in that as an Amazon Prime member, you get Free shipping and sometimes opportunities to get sales before everyone else? Cyber Monday really does get better. More people buy items online on Cyber Monday than they do on Black Friday. The amount that people spend are about the same on both of the shopping sale days. However, there are more bargains to find online than there are in the actual retail stores – which means you end up saving more so you get more when you shop on the Internet. Plus, there are all the comfort perks that go along with Cyber Monday. First, you don’t have to drag yourself out of your warm bed at the crack of dawn to rush out in the dark so you can get to the store and get what you want. Before someone else takes all the stuff that you wanted. With Cyber Monday, you avoid the early morning rush. You also don’t have to get into your vehicle and drive all over town to find the deals. You don’t have to stand in the never ending line wandering if you’ll see the checkout before Christmas. By shopping on Cyber Monday, you can sleep in. You can find everything you want just by typing in what you’re looking for. There won’t be any lines and you can have all your stuff brought right to your doorstep. If you’re wondering what kind of stuff you can get, you can get whatever it was that you could get on Black Friday. The difference is you save money and you get what you want. Furniture goes on sale during both holiday events. What a lot of the retailers do is offer a percentage like 10% off for every $100 that you spend so that ends up a huge savings for you if you’re looking for new furniture. There are some sale events that are flat out gimmicks. Some are hassles and some will offer sale items, but have such a limited supply of the sale items that only a handful of people are able to get any kind of savings. This kind of experience with sales that weren’t helpful have some people trying to decide – is Cyber Monday worth it? But for people who think like that, it’s only because they haven’t experienced the fun of getting great items at unbelievable prices before. It’s definitely worth it to get the things you want to have for yourself or others and save money in the process. When you think about the sale day, think about big ticket items that you could get. With the majority of these, you end up saving hundreds of dollars. 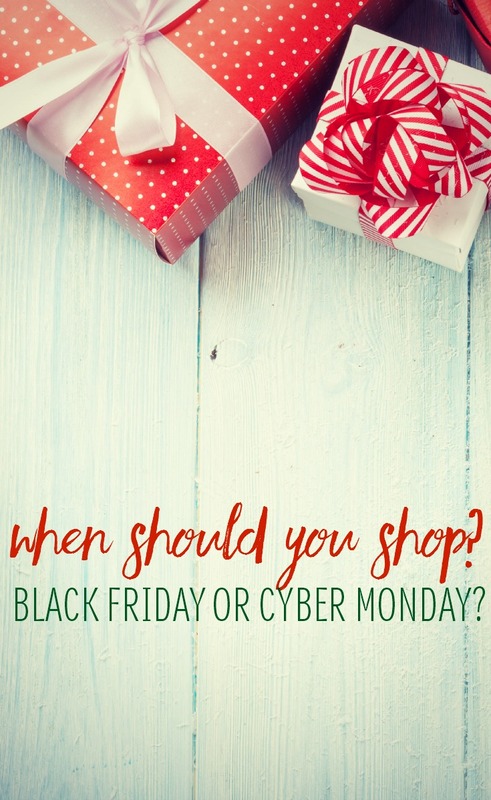 So if you’re in the market for something like a new appliance, then you need to make a list of the items you want and go shopping on Cyber Monday. You can find things such as refrigerators. And not the low end, off brand ones either. You can find top of the line, name brand refrigerators on sale. Online stores like Lowes, Home Depot, Sears, Amazon and more will usually have appliances on sale. If you are planning to shop for Cyber Monday, here are a few things to keep in mind. Everything you read now about Cyber Monday deals are only rumors, but you can get the gist of how things are going to go by perusing the online websites totally dedicated to helping you find the best deals on Black Friday through Cyber Monday. Last year, many retailers had sold out of popular items by Cyber Monday. Walmart was the only retailer who offered some of the best new deals to be had on Cyber Monday evening – catering to the online Monday shoppers who can’t shop until the evening hours. Look for Cyber Monday 2017 sales to begin being announced on the Saturday just after Black Friday. Sunday may be your best time to shop for the best deals if you want to ensure the purchase of the items you want. Amazon is also expected to follow Walmart’s lead and announce their most coveted bargains on that Saturday – but they won’t be offered until Sunday and on into Cyber Monday. If you miss both Black Friday and Cyber Monday, you’ll still have a chance for some blockbuster bargains during Cyber Week. Amazon will have an Amazon’s 12 Days of Deals special that will surely whet your appetite for shopping. Amazon will also offer major deals during the Black Friday weekend. The bargain you get depends on the items you’re interested in. It’s a chance to get some great deals online without joining the fray on Black Friday. Best Buy is also expected to jump on the Cyber Monday sales day in a big way, but as yet hasn’t announced their deals. Keep in mind that the best Cyber Monday deals will be for appliances, TVs, tablets, laptops and cell phones, but if you’re looking for other categories, you’re sure to find a bargain. Websites can help you maneuver the sales and alert you to announcements. Find the Black Friday or Cyber Monday websites that appeal to you and sign up for more information. So is it Black Friday or Cyber Monday? When it all boils down to it, Cyber Monday is my shopping day of choice- if I haven’t purchased my gifts already. This year, the main gift that I will be purchasing on Cyber Monday is for myself: a brand spanking new DSLR camera. Which do you prefer? Black Friday or Cyber Monday?